The White House is re-evaluating whether US President Barack Obama needs to participate in a summit this autumn summit with Russian counterpart, Vladimir Putin, after Moscow granted asylum to NSA leaker Edward Snowden. “We are evaluating the utility of the summit in light of this,” White House spokesperson, Jay Carney, said. The US is “extremely disappointed that the Russian government would take this step” despite Washington’s official and private requests to expel him, he added. 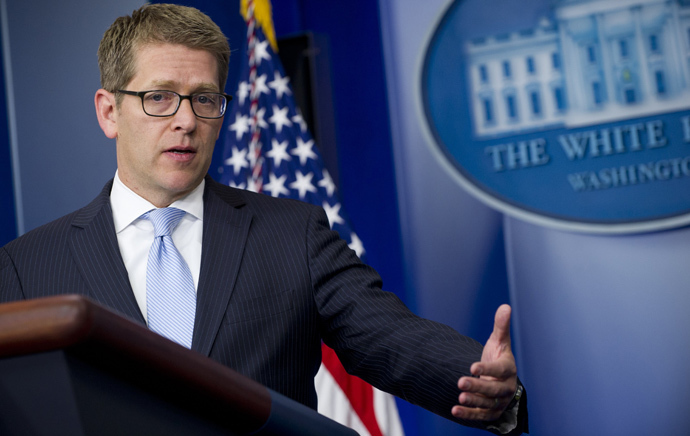 Carney stressed that Snowden’s asylum is an “unfortunate development” in US-Russia relations, undermining the record of law enforcement cooperation between the two states, which was on an upswing since the Boston bombings. The White House spokesman stated that Washington would soon contact Russian authorities on the issue. At the same time, Carney said that the US doesn’t want “Mr Snowden to become a problem” in US relations with Russia, which cover “important and broad” issues. The spokesman stressed the US doesn’t view Edward Snowden as a whistleblower or dissident, reminding that the NSA former contractor is accused of leaking classified information in his home country. Next week’s talks between US Secretary of State John Kerry and Russian foreign minister, Sergey Lavrov, were also “up in the air,” a US official told Reuters, speaking on condition of anonymity. McCain’s proposed countermeasures include, expansion of the Magnitsky Act, completion of all phases of the US missile defense programs in Eastern Europe and support for Russian “dissidents” like Mikhail Khodorkovsky and Alexei Navalny. On Thursday, Snowden was granted temporary asylum in Russia and was allowed to enter the country’s territory. According to the issued documents, the former CIA employee who broke PRISM spying scandal to the world is free to stay in Russia until at least July 31, 2014. Then the asylum status may be extended. With that in hand, Snowden cannot be handed over to the US authorities, even if Washington files an official request. He can now be transported to the United States only if he agrees to go voluntarily. On receiving the asylum documents, the former NSA contractor left the airport for an unspecified destination; concerns over his security were cited.